The free Family Medical Details Template is the perfect way to help track your family medical history. You can even start one for your children to refer to when they need medical assistance. 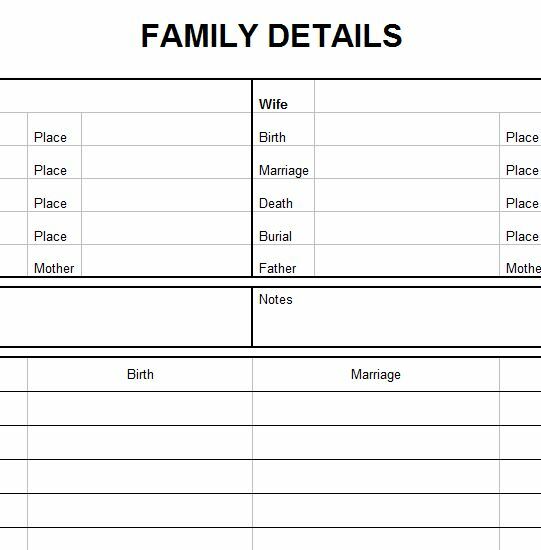 This free template is a way for people to write down known medical issues that are common in your family. Knowing this information can help doctor’s properly diagnose issues that might otherwise be misdiagnosed. You will simply fill in the family history in the template and store the documents for safe keeping. This may not seem like a big deal but it might be for your children or grandchildren. This template is all about, the future. To download and use the free template, simply follow the list of instructions below. To download the free template file, just follow the link at the bottom of this page. The next step will be to open the free file on your computer and enter the information for your father and mother. Choose the parentage that you can trace back as far as possible. For example, if you know the cause of death for your great grandparents, start with them. You can always create more tabs and copy the table for the next generation. We will continue with the example. Let’s say you know the medical history of your great grandparents. You would enter the appropriate information for them, with any additional notes, and then list your grandparents on the “Children” section. You would then copy the tab and start a new table, this time starting with your grandparents at the top and listing your parents in the children section. You will repeat the cycle until you’re all caught up. Over time, you will start to recognize certain patterns with health issues. You can give doctors this information to make accurate diagnoses.